Na Nach Nachma Nachman Meuman: Breaking News !!! Rabbi Natan wants us to do Rosh Hashana in Israel! The hottest news about Na Nachs all over the world. 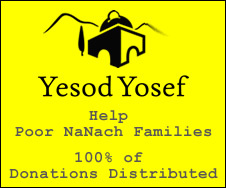 Sabba Yisroel, the keren, pictures, videos and articles about hafatzah. We're about real people screaming Na Nach Nachma Nachman Meuman! Breaking News !!! Rabbi Natan wants us to do Rosh Hashana in Israel! Read all about it from Pgs 94 to 106 in Likutey Halachot #2 Orat Haiim. It starts getting very obvious around the beginning of pg. 96. Enjoy your studies! Yes, my friend, this is in Hilchos Bircas HaPeiros, where Rabbi Natan speaks at length about how great a Jew's yearning to live in Israel should be, keeping in mind that in his days, traveling on seas was far more dangerous and uncertain than overseas travel is today. And by the way, after the young Breslover who was just murdered in Uman on Rabbeinu's 200th Yahrzeit, I think it is high time that Rabbeinu gets transferred to Israel. It has reached the point that even Ukranian thugs won't accept money to hold back from murdering a Jew. It's about time that everyone wakes up and realizes that Rabbeinu has had enough being forced to stay buried outside of Israel because of the few "Breslov" rabbis who went out of their way asking the Ukranian government to let Rabbeinu's gravesite be a shrine when it was under threat of being taken over, in order to look like heroes to be responsible for the yearly Uman-Rosh Hashanah pilgrimage, when all they had to do with their same power was just to transfer Rabbeinu to our Holy Land.